Why, just the other day we were opining on the pros and cons of the massively popular Guitar Hero game. Well, get ready for more opining, because now Aerosmith is getting into the act. Or game, rather. Confirming long-standing rumors, Activision has announced that they're teaming with rock band Aerosmith to produce an entirely new "Guitar Hero" game dedicated solely to virtually playing along with their songs, titled simply "Guitar Hero: Aerosmith." Typical of a "Guitar Hero" announcement, the track list is currently a secret, but the press release did name-drop "Don't Want to Miss a Thing," "Love in an Elevator," "Dream On," and "Sweet Emotion." "On a larger scale, it's cool for us to be pioneers, helping to rebuild the music industry through a format like video games," said Aerosmith singer Steven Tyler in the press release. "It's great for rock since the record companies are struggling to make sense of how things are changing. Fans want to get and experience music in new formats -- and there are going to be some of them who will play the game, then pick up the guitar for real and start bands." This isn't Aerosmith's first appearance in modern music games, either. The band has had six songs spread across the "Guitar Hero," "Karaoke Revolution" and "Rock Band" franchises. Neversoft, the same folks behind last fall's "Guitar Hero III: Legends of Rock," is behind the Aerosmith "Guitar Hero" collaboration. 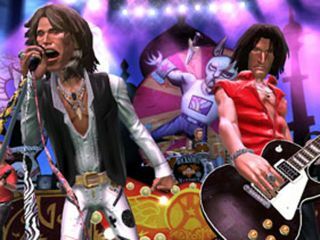 If you haven't yet upgraded to a PlayStation 3 or Xbox 360 yet, no worries: "Guitar Hero: Aerosmith" is also coming to Wii and PlayStation 2, courtesy of Vicarious Visions and Budcat, respectively.